Today’s townland is Ballymacarrett, a district of East Belfast. 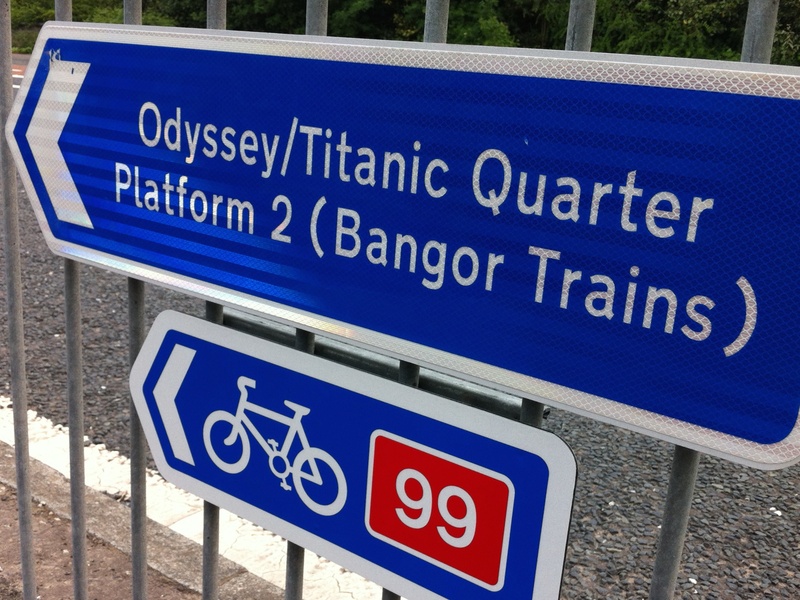 The standard spelling has two “r”s and two “t”s, but the PLACENAMESNI website gives it only one “t”, and the sign in the photo below spells it differently again. Ballymacarrett is the 13th townland on the Comber Greenway. The “Odyssey” referred to in the photo above is an entertainment arena in the neighbouring townland of Ballymacarrett Intake, not a description of my walk from Comber. I entered Ballymacarrett when I crossed the Connswater River from Ballyhackamore. 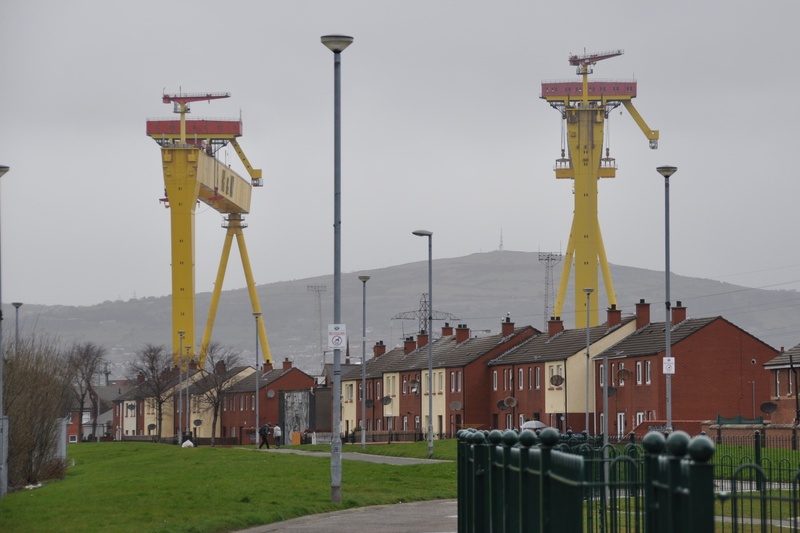 Immediately the landscape was dominated by the cranes of the Harland & Wolff shipyard, which are also in Ballymacarrett Intake. The shorter crane on the left is known as Goliath; the taller one on the right is Samson. If you are wondering about the hills in this photo, they are actually on the far side of Belfast Lough. 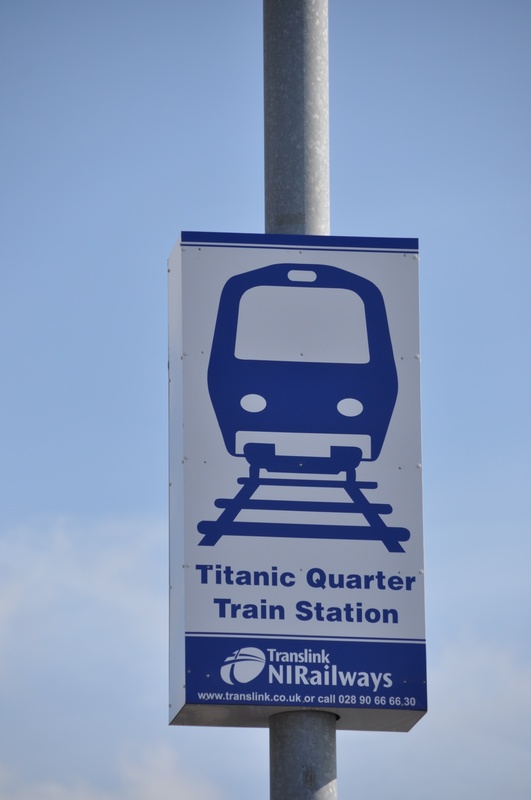 The next section of the Greenway isn’t traffic-free, so I followed signs along Dee Street and Island Street towards Titanic Quarter station. Yes, the Greenway, which traces the path of a disused railway line, finally reaches a place where trains still run. 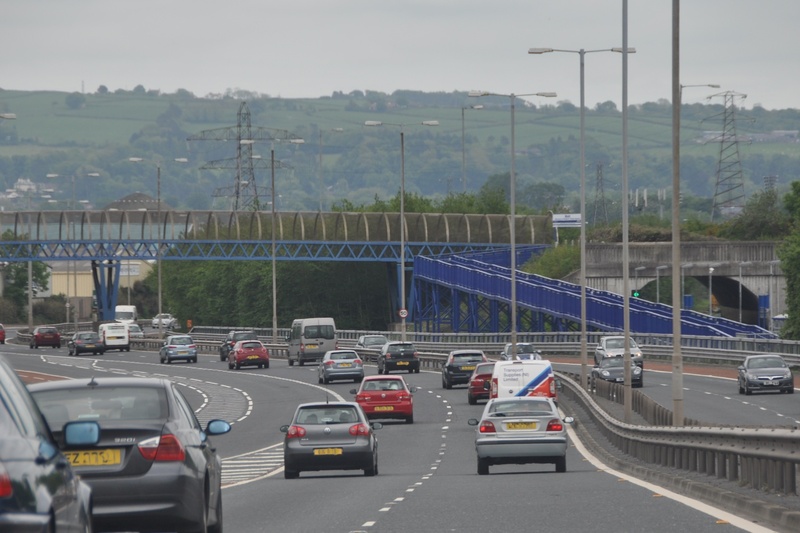 To reach the end of the Greenway, walkers and cyclists use this blue bridge to cross the railway line and the A2 Belfast-Bangor road. 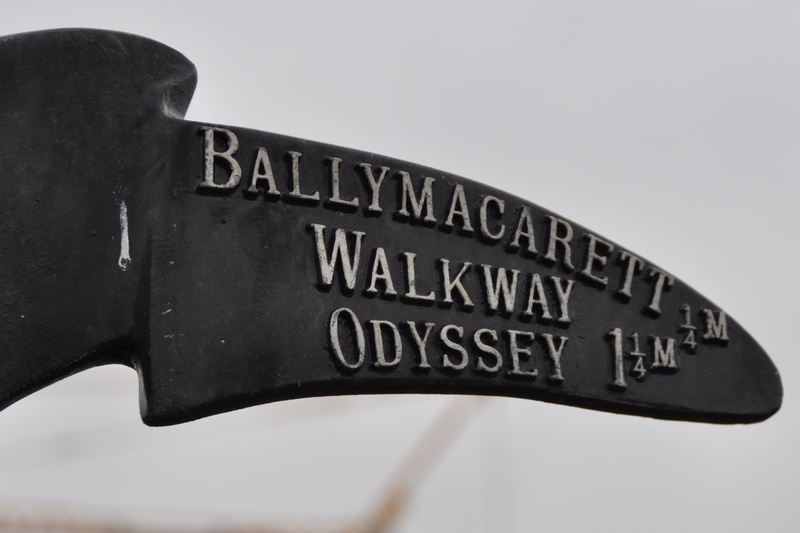 According to the PLACENAMESNI website, the name Ballymacarrett comes from the Irish Baile Mhic Gearóid meaning “MacGarrett’s or MacCarrett’s townland”. The MacCarretts would be justified in complaining that I haven’t done justice to their townland, but for now, I’m concentrating on the Comber Greenway, so I’m rushing over the bridge to the next townland, which is Ballymacarrett Intake. I am laughing because the port city of Belfast manages to look idyllic rather than ugly, grease-coated and heavy-duty industrial like the ones here. Cheerily painted cranes! Neatly-kept row houses! Green lawns, forsooth!